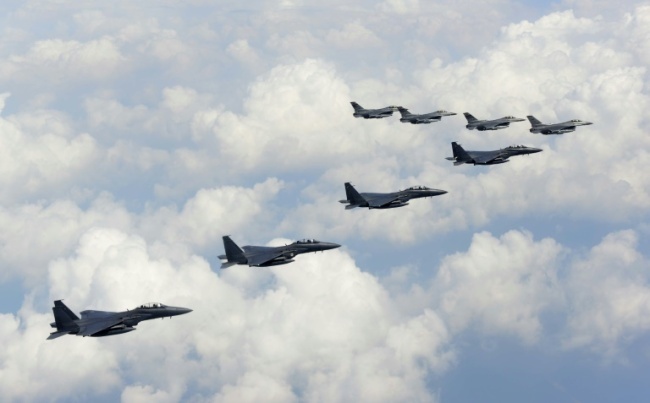 A Chinese military airplane entered South Korea's air defense identification zone on Friday, prompting F-15K fighter jets to make an emergency sortie in response, Seoul's defense authorities said. It flew into the KADIZ from southwest of Ieo Island at around 7:10 a.m., moved along the southern and eastern coast before changing direction, according to the Joint Chief of Staff. It exited the zone at around 11:27 a.m., added the JCS. The Chinese jet is believed to a Y-9 tactical aircraft. The Ministry of National Defense called in the defense attache at the Chinese Embassy in Seoul to lodge a complaint. Choi Hyong-chan, director general of the ministry's international affairs urged Beijing to prevent such a "serious" case from occuring again, ministry officials said. Also Friday, South Korea's foreign ministry summoned a senior Chinese Embassy official in Seoul and expressed regret over the latest intrusion. Chinese military planes entered the KADIZ in February and April as well, taking similar flight paths. An air defense identification zone is airspace over land or water declared by a state for the early identification and location of a foreign plane approaching its territory. It's not defined in any international law or treaty.